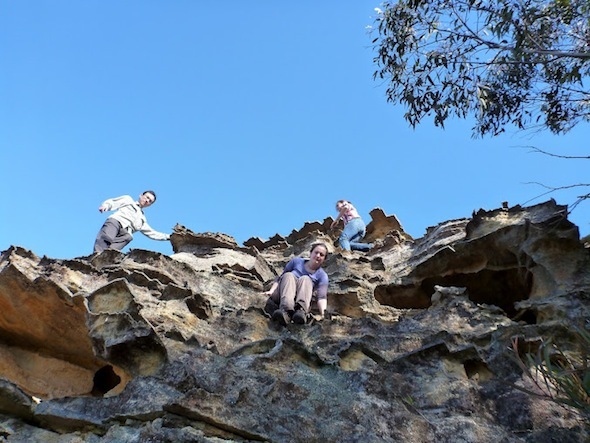 With the first weekend of semester being a good time to make and keep new resolutions, four enthusiastic SUBW members signed up to Tim Vollmer’s promise of a “nice overnight bushwalk… something not too hard” to the Red Rocks over the 4th August weekend. After a few more hours drive we bumped along the end of the dirt road and over one particularly boggy patch, and decided to park the car at the base of Little Capertee Creek Valley to walk in the last kilometre. Everyone piled out of the car and wandered off in different directions behind various bushes. At this point, two unexpected things happened: (1) I forgot to check for stinging nettles, and (2) a mad looking old man wearing a flannel coat and wielding a foot-long chef’s knife appeared out of the scrub, calling “puss-puss-puss-puss-puss”. Luckily the second event was interesting enough to distract my attention away from the more uncomfortable first one, and while Tim made small-talk with Cat-man the rest of us grabbed our packs from the boot and edged away. No, we hadn’t seen his cat sadly, and yes, it was a lovely day. We never did find out whether he was on the trail of a feral to butcher, or just carrying along the first can-opening implement that came to hand to feed his lost tabby. For a promised “not too hard” trek we set off at a cracking pace, with Louisa and Nicola soldiering along in the rear and Chee doing a great job of maintaining communication between us and the Vanguard, who was charging along ahead out of sight. The hour-long scramble up rocky scrub ended up being the hardest uphill of the whole weekend, and we enjoyed a generous morning tea stop on the lookout, with beautiful soft views down into Cat-man’s Valley. Once up on the ridge, the afternoon’s walk was pretty straight forward trekking through scrub, so we took a few scenic detours up promising lookout pagodas along the way. It was here that one member of our party discovered an unfortunate ability for dislodging boulders, not once but twice. The first time, we’d set our minds to get up a trickly little climb up a steep chute and over a wedged boulder. 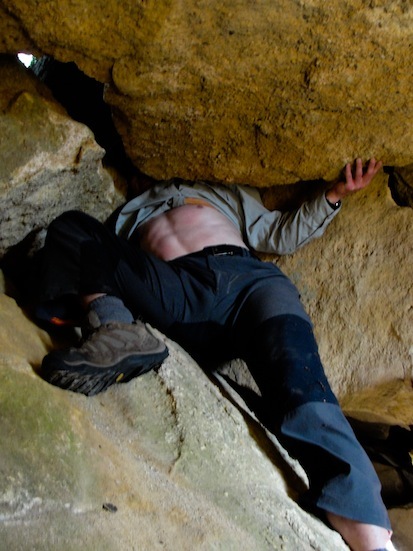 While I was dubiously inspecting the stability of this boulder (seeing as I was perched under it), Tim hauled himself up onto it with a casual “all good”. So I came up next, testing another head-sized rock next to it — which promptly cracked free in my hands. The people below got themselves squarely out of the way, but no-one thought of our packs at the bottom of the chute until the boulder was gathering speed and hurtling towards them. Happily, it hop-scotched its way past all of them, and we all got up the pagoda without further incident for some great photos. The angle of the rock wall turned out to be completely deceptive however, and the climb up was easy enough to do it without even needing to take our packs off. 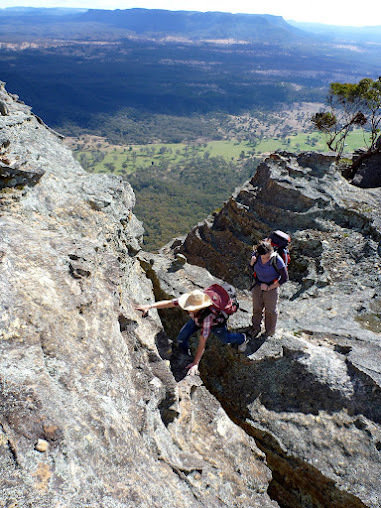 I guess we were getting off a bit too lightly, because near the top I was just above another sheer drop when a massive (maybe wombat sized) boulder cracked free from the cliff edge under my hand and plummeted the hundred metres or so towards the valley floor. 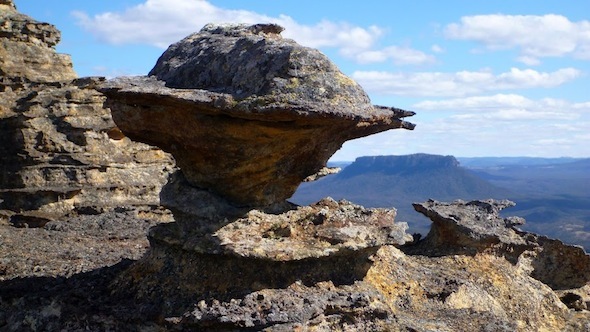 The others were more shocked than I was, as I hadn’t had any weight on it, but it must have looked impressive with one hand in mid-air and this thunderous sound of the boulder crashing down, then a billow of dust as the boulder hit the canopy and broke up on the rocks below. 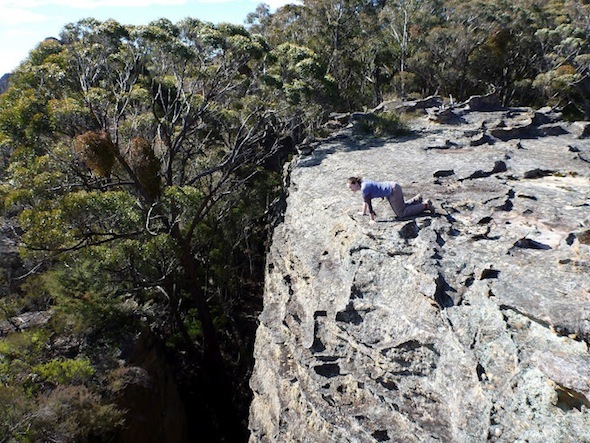 After these adventures Tim was gearing up for something he called “the Leap of Faith”, muttering things like “just you wait for this one…” and hinting at — well, something more than the maybe 20cm crack we stepped over before really realising it was there. Perhaps the Leap had shrunk- or at least the Faith needed to cross it. More excitingly, Nicola led us down an interesting looking crack that ended in what shall — or should — be called “The Squeeze”: a wedge-shaped gap, just narrower than hip-size and possibly smaller than head-size, blocking the way into a very tempting cave. Challenge accepted. Admittedly it would have been a very awkward spot to stay stuck (or very funny, as the others kindly pointed out once I was shimmied feet-first deep enough into the funnel to make it a point of no return), but luckily my head fitted and I was through. It was getting towards dusk as we neared the area we were hoping to find Camp Cave. We’d left our tents in the car on our trip leader’s confident expectation that we “should” find the cave, but the directions (admittedly based more on creative interpretations of previous trip report photos than anything else) were proving a bit vague in the scrub. So it was pretty exciting to hear Chee suddenly call out: “FOUNDIT!” When we asked him how he was so sure, he pointed at a perfectly indistinguishable patch on the rock wall, amongst dozens of other perfectly indistinguishable patches of rocky wall, his face lighting up: “I recognise that patch!” Amazingly Chee’s tracker skills proved right — and the Camp Cave around the next corner did indeed live up to all its promises. We decided to set up with a cheese platter and wine to watch the magnificent sunset on Mt Dawson from the nearby lookout. The glowing sun was sinking lower and lower towards the point of setting over the silhouetted ridge opposite, which was magnificent, but not quiet magnificent enough to distract us from the fact that it was also getting colder and colder. The guys had thoughtfully put on their down jackets, but Nicola and I were shivering so much in t-shirts we decided to race to the cave for our jumpers and make it back for the sunset. But then somehow, in the dash back through the 300 odd metres of scrub I ended up on the wrong pagoda. In fact, two pagodas over, the one which was the highest and had the best outlook all round. Turns out the others had been calculating the climb and wondering if it’d be possible to get up there — although none of that mattered very much to me, realising not only was I almost a kilometre away on the wrong mountain outcrop to the other three, but also that I was a kilometre away on the wrong mountain outcrop to the cheese and wine. Very confusingly, the Accidental Summit also proved just about impossible to get off, taking three attempts, all ending on big drops and overhangs, and for the life of me I couldn’t figure out how I got up there by mistake in the first place. Camp Cave truly came into its own that night, looking up at the dying embers of the campfire flickering off the sandstone overhang, as we lay curled up in our warm sleeping bags. Most of us had a pretty luxurious sleep-in the next morning on the soft cave floor too, with nothing waking us up til past 10am. By the time we emerged from our sleeping bags Chee had been up a few hours, had found the creek, and even filled up all the waterbottles and bladders with filtered water. The contraptions he pulled from his lightweight pack over the whole weekend never failed to get a comment (the mattress inflating giant-condom being a pretty ridiculous low-point), but waking up to fresh water in all our bottles thanks to his hand-pumping filter was admittedly pretty cool. Thanks Chee! Sunday’s walk was (another) highlight of the weekend. We dropped into an amazing canyon, which apparently some previous groups had had to backtrack up to from below, to explore. But we found a new way to wriggle down what had seemed like a dead-end drop, and enjoyed a magnificent end to the weekend walking out through the lush wet-feeling of the mossy canyon. To everyone’s delight our newly discovered canyon even had a “hole”! 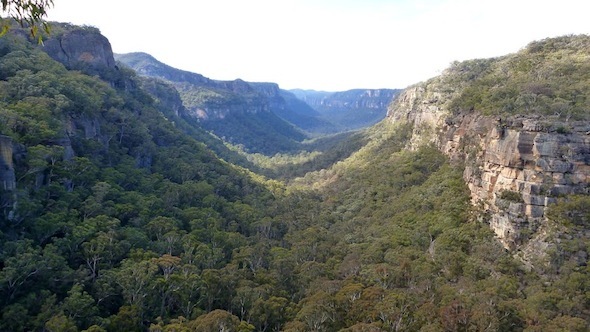 Successfully finding a way right through the canyon, without ropes, would have to have made it one of my favourite bushwalk-come-unexpected-canyoning-trips to date. Making good time we were back at the cars in time for a late lunch on the banks of the Wolgan River, and this time there was no sign of Cat-man or his puss. I can safely say it was great trip thanks to Tim’s leading (once he slowed his initial enthusiasm down to a followable pace), to Chee’s magic cave-tracking instincts — and to Nicola and I learning a few valuable lessons on our first off-track trip: to watch out for falling boulders, to watch out for the wrong lookout (particularly if the right one comes with wine and cheese), and in my case above all to look out for nettles. 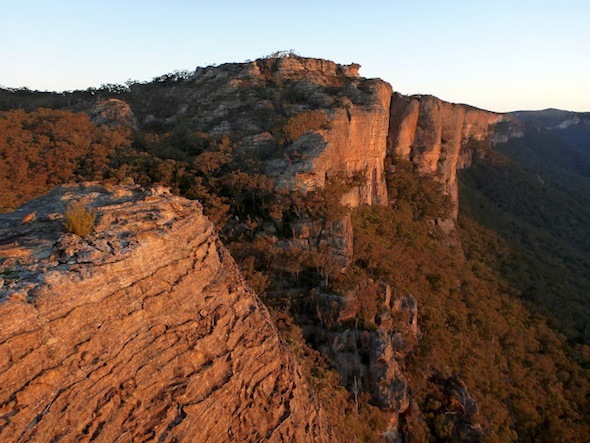 Just the mention of Red Rocks and I am transported back to the 1970s and a walk from Newnes to an overnight camp at the said Red Rocks. Don’t remember scrambling over pagodas and was probably on a different route but to camp out in the vicinity and watch the sunset was magic experience. To be able to vicariously visit this area via your stunning images and detailed commentary is a real boon since carrying a camera was not universal in those days (too heavy), camera stops were generally a no no, and we took so few slides because of the cost. The boulder falls sound a bit hairy. Glad it wasn’t me. Barbara, I love the feedback as always, especially your memories from your own trip. 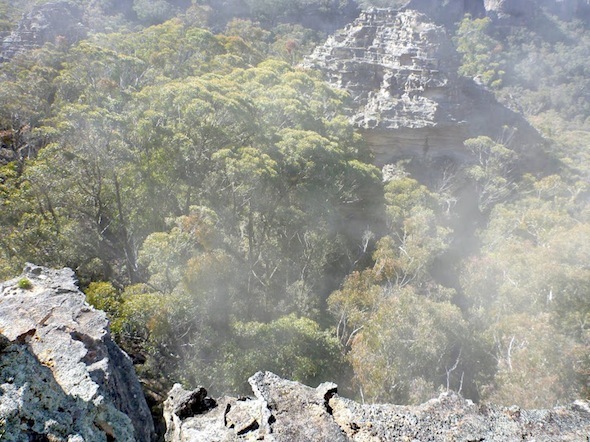 One of the things I really enjoy about bushwalking is how you not only feel connected to the place, but the place connects you through time to countless people. 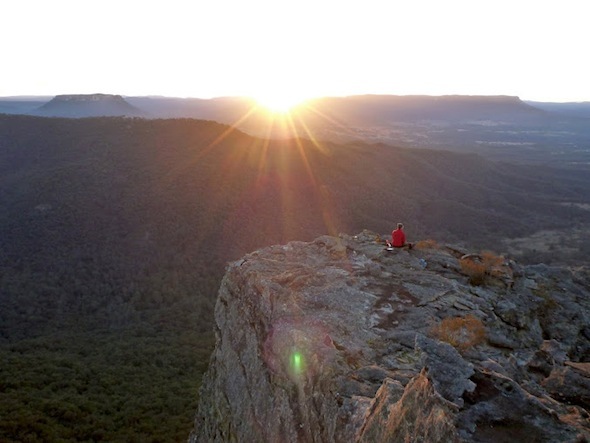 Who knows how many thousands of people have enjoyed that spot — from the indigenous people, through to early Europeans, to bushwalkers over decades — yet as those rocks glow in the sunset there is a commonality of experience that ties us all together. It’s the same reason I have a habit of resting my hand on the trunks of mighty trees beside common routes, knowing countless other hands have shared that tactile experience. Inspiration – and fun! I’ve seen so many amazing photos and read so many trip reports that I’ve decided I’m going to head out there. But I’d like to probe for information. On the Ben Bullen map, due (grid) east from Mt Dawson there appears to be quite the tight valley where (big) Capertee Creek heads down to Newnes. Closer to Newnes there is in fact a track marked (road? map not in front of me) but it only reaches half-way between the high tops and Newnes. Does anyone know if this return plan is in fact walkable? 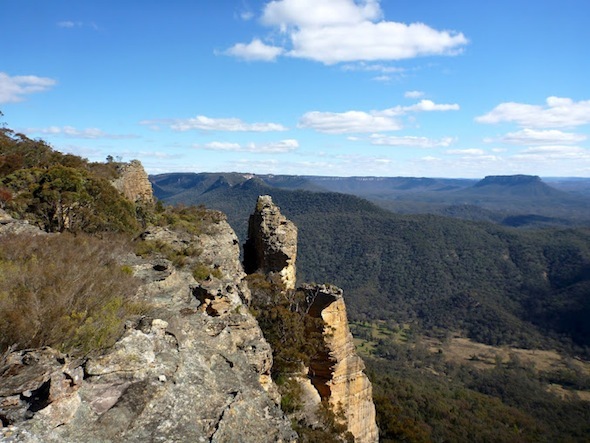 Are there private properties lower down closer to Newnes that may cause problems in coming back this way? Steven, I love it when the trip reports / photos convince people to explore a new area. You will not be disappointed. I absolutely love the Red Rocks. After two trips there I’ve still got a hell of a lot more exploring to do! I haven’t explored Capertee Ck, but my guess is it would be quite similar to Little Capertee Ck. Mostly very walkable. Possibly a small canyon section higher up (you do come across some small canyon sections around there). From the map it would appear there is a road reserve running through the private property, so you shouldn’t have a legal issue with access. If I were you I’d call the Newnes Hotel (6355 1247) as either Thomas, the owner, or the old local who runs the place on weekends will know whose properties you will need to go through and how friendly they are. My experience of the locals (like the ‘cat man’ Glen Day) is that they are very welcoming of walkers. I’ve even had one offer to let us collect firewood on their private land for a car camp at Newnes! Another person worth contacting would be Dave Noble. He’s been walking that area for decades and knows it better than anyone else.